What is the Early Development Network? EDN serves children ages Birth to 3 years who may be experiencing developmental delays or serious health/medical issues that affects their health and development. Services are also provided for the family as it relates to their child's special needs. EDN operates year around; 12 months. It is not limited to the school calendar. EDN is co-administrated by the Nebraska Departments of Education and Health and Human Services via Part C of IDEA. 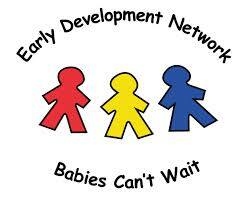 What service does the Early Development Network provide for families? What is the cost to families to participate in EDN? EDN is a free, voluntary program with no income guidelines for infants/toddlers experiencing delays, and their families. Who can make a referral to EDN? A referral may be made by anyone concerned about the child's development by calling: 1- 888-806-6287. You may contact your local EDN agency to make a referral at (402)371- 7284. With the family's verbal permission, the EDN Services Coordinator will follow-up with the referral to advise of the status/outcome of the child's referral. What happens after I make a referral to EDN? Families who choose to participate receive an evaluation by the local school district to determine the unique needs of the child and his/her eligibility. The evaluation is to be conducted in the family's native language, if feasible. The local school district staff evaluates the child in 5 domains to determine the child's specific verification for EDN Special Education services and to determine which services will best improve the development of the child. EDN does not require proof of citizenship to receive evaluation or services. Once a child is verified per state/federal criteria as eligible for EDN services, and Individualized Family Service Plan (IFSP) is developed which sets goals for the child/family and identifies activities/services needed to achieve those goals. Currently, the IFSP is available in Spanish and Vietnamese. Once a referral is received by the local EDN agency, the evaluation and IFSP is completed and implemented in a maximum of 45 days. All medical/health and related professionals working with the child should receive a copy of the IFSP from the Child's Services Coordinator, with parent permission, as all are working together as a team to service the child. If the child moves, copies of the evaluation and IFSP can be sent to the receiving early intervention program. Who may benefit from EDN services? child with serious health issues/abnormalities requiring medical interventions, such as feeding tube, g-button, shunt, catheterization, colostomy, etc.